Ruby and Yellow Gold small front facing hoop earrings and the Large Orbit Hoop Multiplier earring jackets sold as a set. 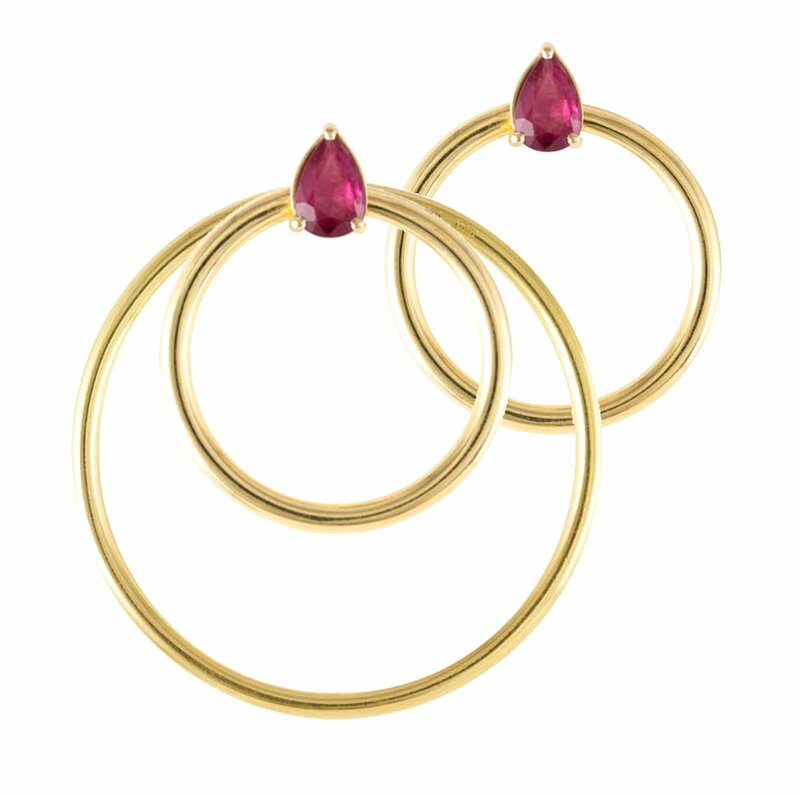 Simple chic earrings set with pear cut Rubies in 18 carat solid gold. Perfectly geometrically balanced, elegant and flattering. This set of the small Orbit hoop earrings and the large hoop earring jacket created a stunningly enhanced look when worn together to create a bolder elegant large double hoop earring as pictured. A fashion favourite as seen in VOGUE and elsewhere. 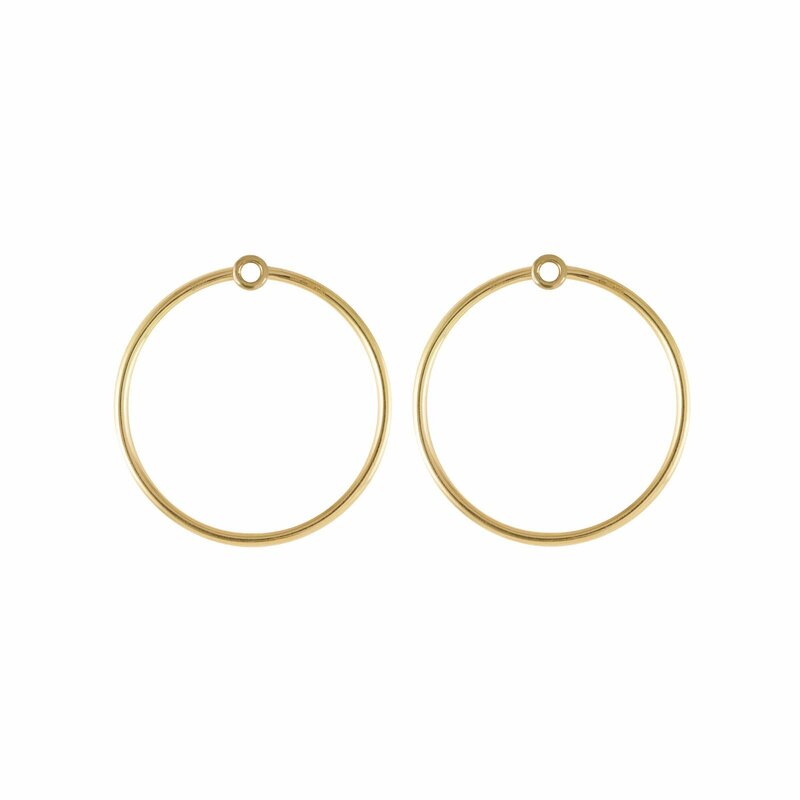 Our hoop earring multipliers are designed to create new variations of earrings from any pair of pierced earrings and work with your own earrings collection. 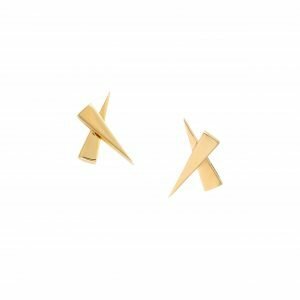 Quickly and cleverly doubling your earring wardrobe creating brand new larger earrings by slipping onto the bar fastening. Yellow Gold, 18k solid, 5.5g and 9g. Ruby 2 pear 6x4mm, 0.65ct. Hoop diameter 2cm and 3.5gm. 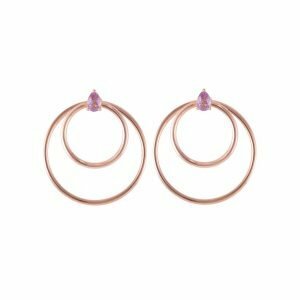 Large hoop slides on to the bar of any pierced earring in-front or behind the earlobe. The exceptional foundations of a unique creation. 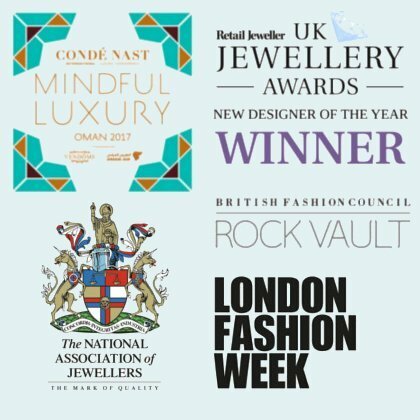 Inspired by light photons and subatomic particles each piece in the collection is designed imagining the awe inducing movement of these high energy particles and the unique radial paths they trace, leading to multi-dimensional jewellery highlighted in glowing gemstones. The individually beautiful pieces then may be combined into arrangements of increasing variety and complexity, creating unique jewels just as particles combine to form all the world of beauty that exists. A single kiss, special and delicate in solid 18 carat gold and diamonds, sweet and dynamic. 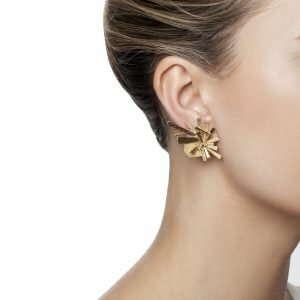 The Kisses earrings makes a perfect gift and a sparkling treasure and mix and match prettily in the gold and diamond styles. Yellow 18k solid Gold. Diamonds champagne 0.08ct. Bar fastening for pierced ears. Kiss design measures 0.8mm across, 1.5mm height, 1.5mm depth. Also can be made in Rose or White Gold. 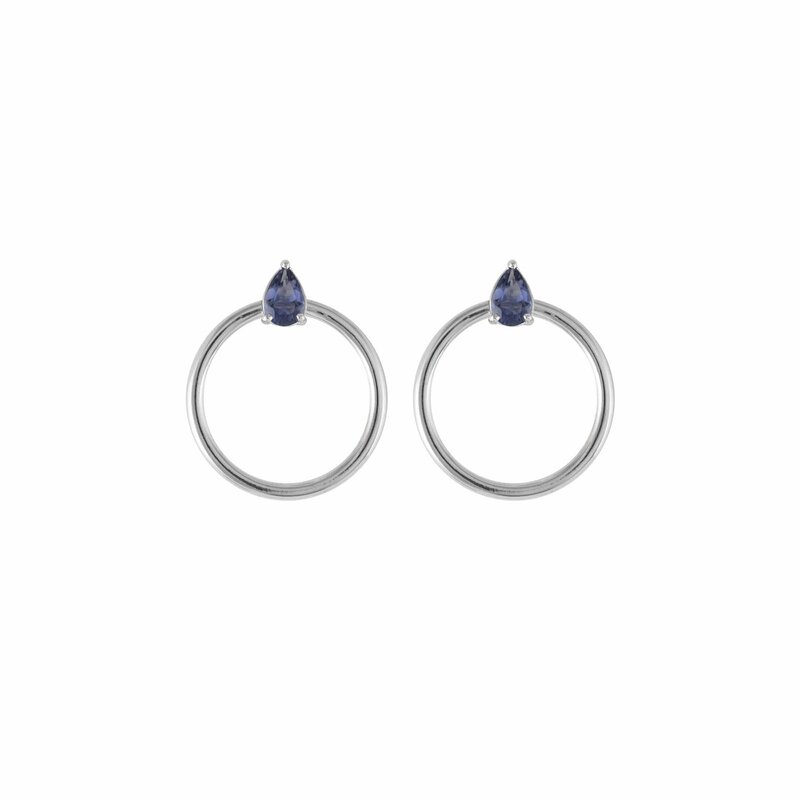 Simple chic yet interesting earrings set with teardrop shaped pear cut Iolite in white gold. 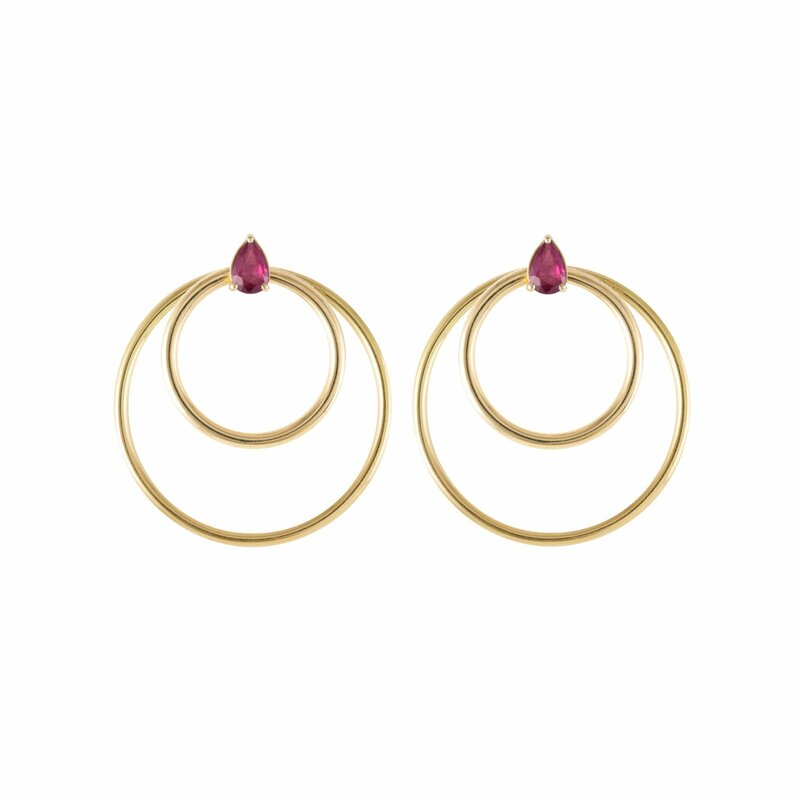 A perfect complement to the Quanta collection and stunningly enhanced when worn with the Large Orbit Earring Multiplier to create a en elegant large double hoop earring. White Gold, 18k solid, 5.5g. Iolite 2 pear 6x4mm, 0.6ct. 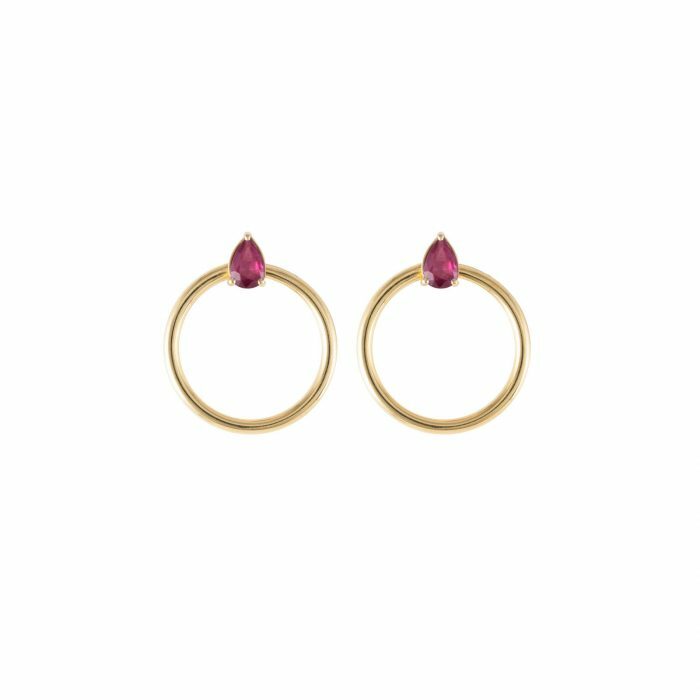 Hoop diameter 2cm. Bar pierced ear fastening. 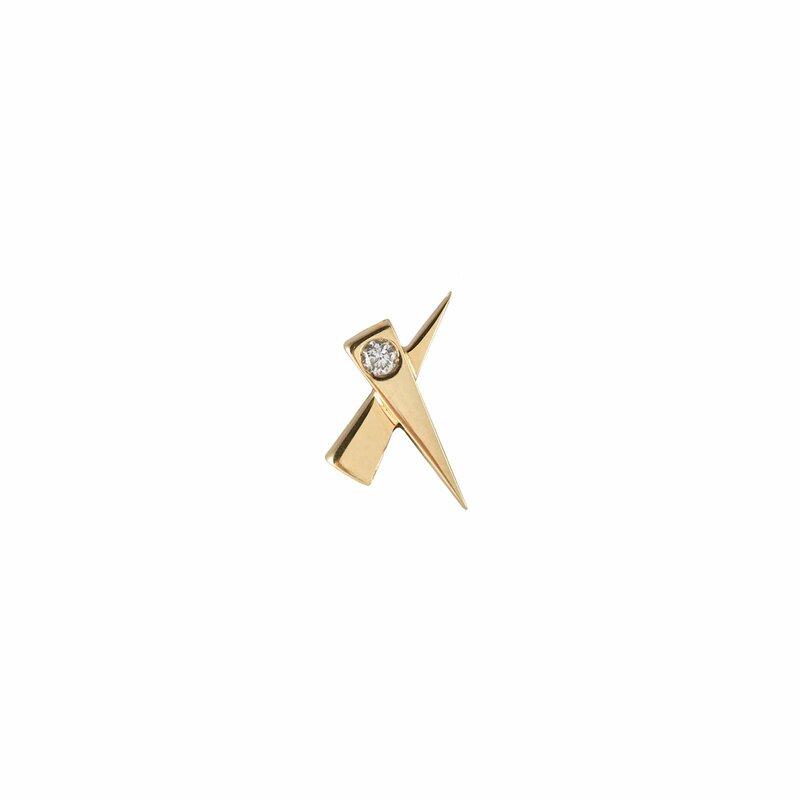 A single kiss, special and delicate in solid 18 carat gold with an accent diamond, sweet and dynamic. 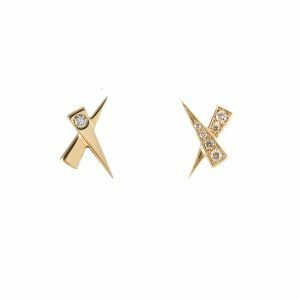 The Kisses earrings makes a perfect gift and a sparkling treasure and mix and match prettily in the gold and diamond pave styles. Yellow 18k solid Gold. Diamond 0.02ct. Bar fastening for pierced ears. Kiss design measures 6mm across, 10mm height, 1.5mm depth. Also can be made in Rose or White Gold. 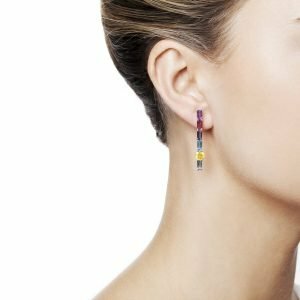 Modern almost Art Deco drop earrings in a harmonious palate of faceted gemstones. Eye catching and evocative in white gold to highlight the cool brightness of the dawn and dusk. Sapphires 2 6mm round yellow faceted 1.47ct. Amethysts, Pink Tourmaline, Iolite, Blue Topaz 10 total 6×3mm 3.5ct. 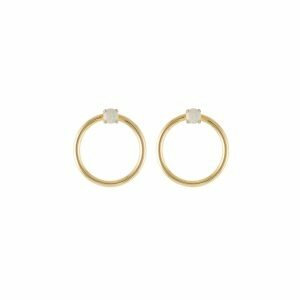 White Gold solid 18k. Hallmarked with the Daou name, by Goldsmiths Hall in London. Also available as Long Pendant. 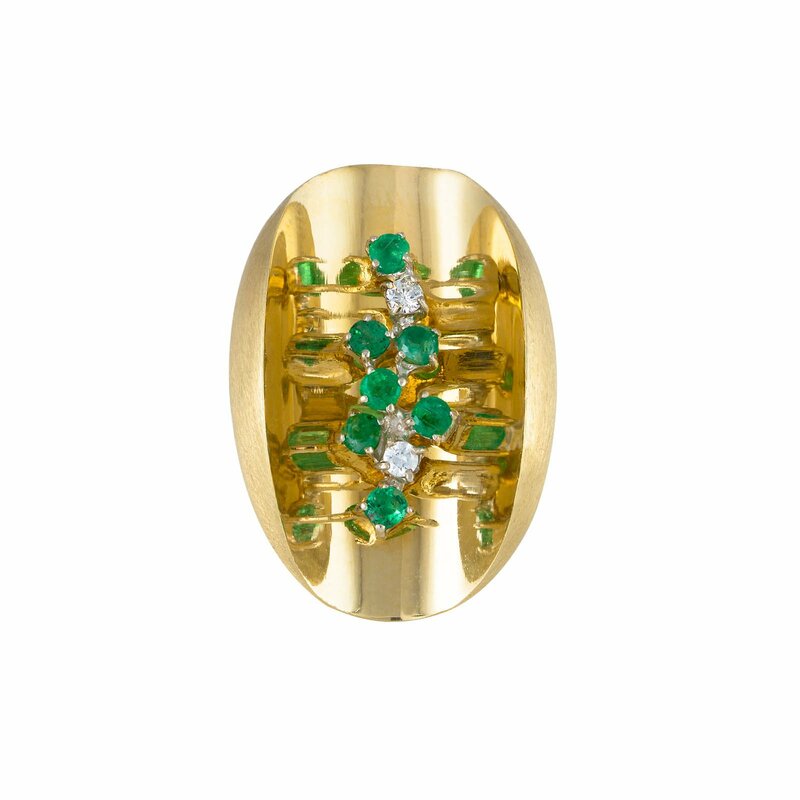 Earring design may be created in Golden colour gemstones. Made by hand, in Italy. Bar fastening for pierced ears. Earring length 3.7cm, width 0.6mm. 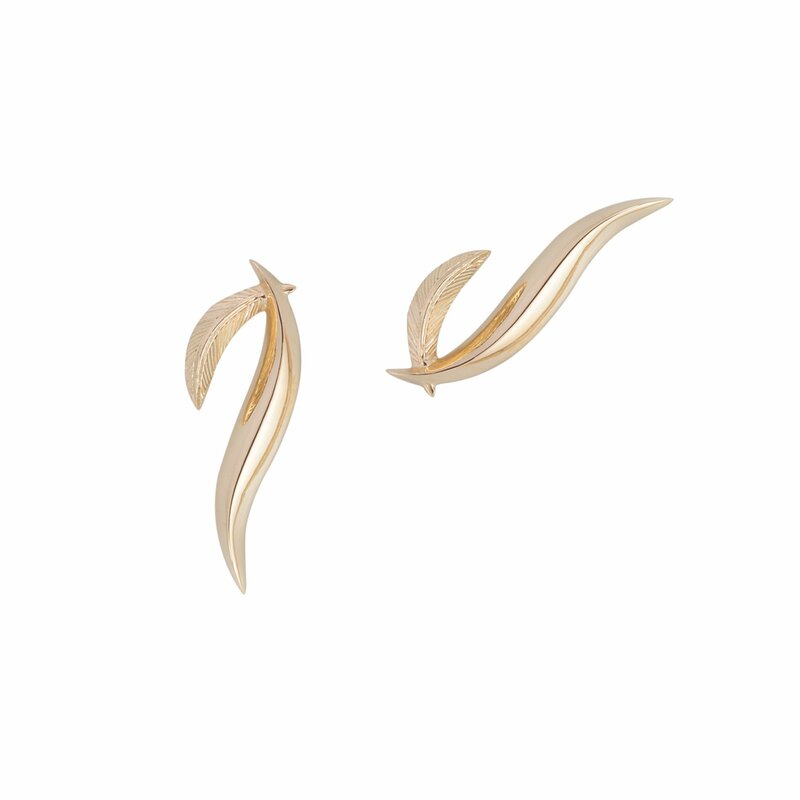 An original Daou heritage piece remade from the 70s the ear climbers design was decades ahead of its time. These ear climbers were descibed as 'Wonder woman earrings' by one male admirer! A style that is both strong and feminine. 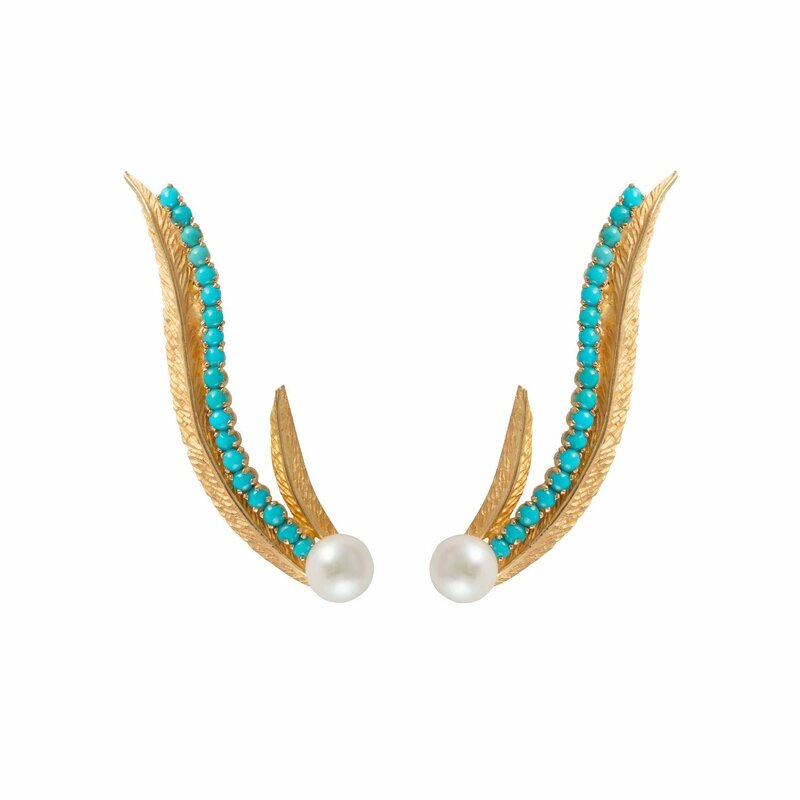 Accents of pearls and turquoise are still retro touches to the sleek feather design. 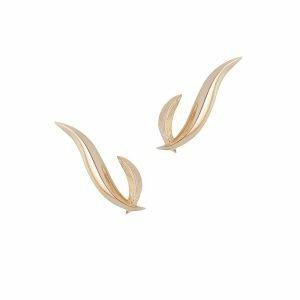 The earrings can be worn flowing along the ear or dropping down showing off the unique shape either way. 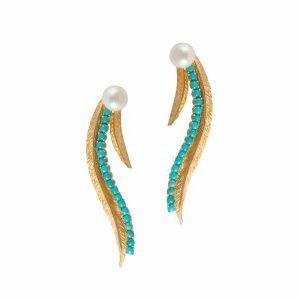 18ct yellow gold solid 7.9gm 38 Turquoise cabochons 2 Pearls 6mm Earring measures 35mm long, 10mm wide The earrings are made to order so please allow 3 weeks to delivery. A single kiss, special and delicate in solid 18 carat gold, sweet and still dynamic. The Kisses earrings makes a perfect gift and a sparkling treasure and mix and match prettily in the diamond and pave styles. Yellow 18k solid Gold. Bar fastening for pierced ears. Kiss design measures 6mm across, 10mm height, 1.5mm depth. Made to order with 4 weeks to delivery. Also can be made in Rose or White Gold. 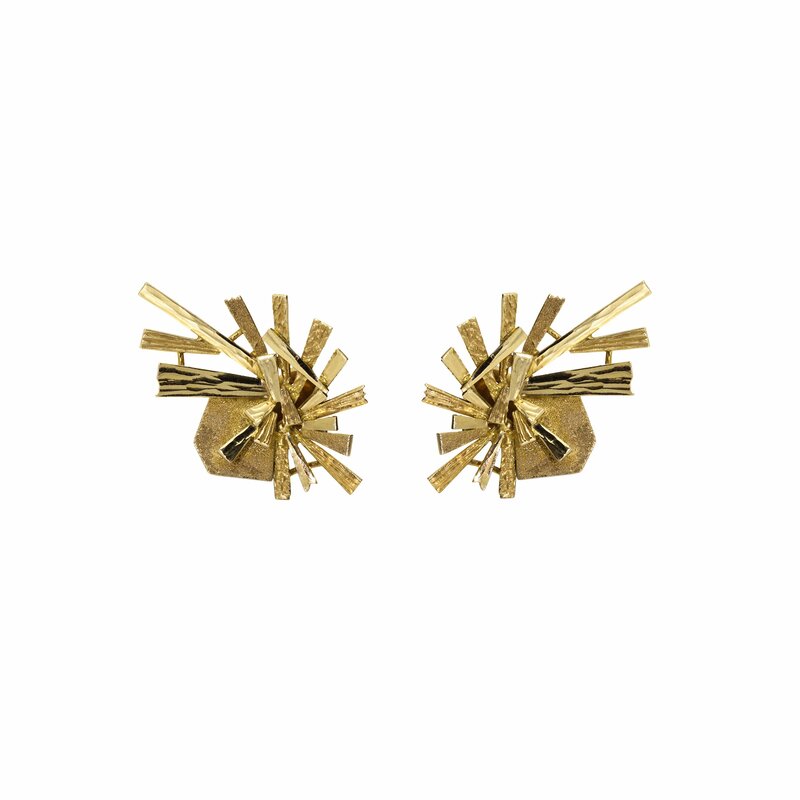 The Spark Cluster Earrings are a wonderful explosion of sparks made of a variety of gold finishes and shapes. The sparks mesmerise with their play of light and luminosity. 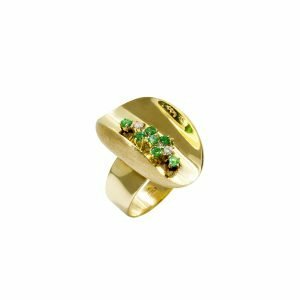 This heritage design is directly from the Daou archives, a piece first created in the 70s around the time of Brigitte Bardot's visit to the salon, when Daou Jewellery was also worn by Grace Kelly and even Queen Elizabeth II. The handmade techniques from the private Daou workshop can be seen in the textured gold work and stunning yet balanced asymmetry. Yellow Gold 18k solid, 14.8gm. Hallmarked with the Daou name, by Goldsmiths Hall in London. French clip (a pin for pierced ears with a clip backing) or clip fastenings. 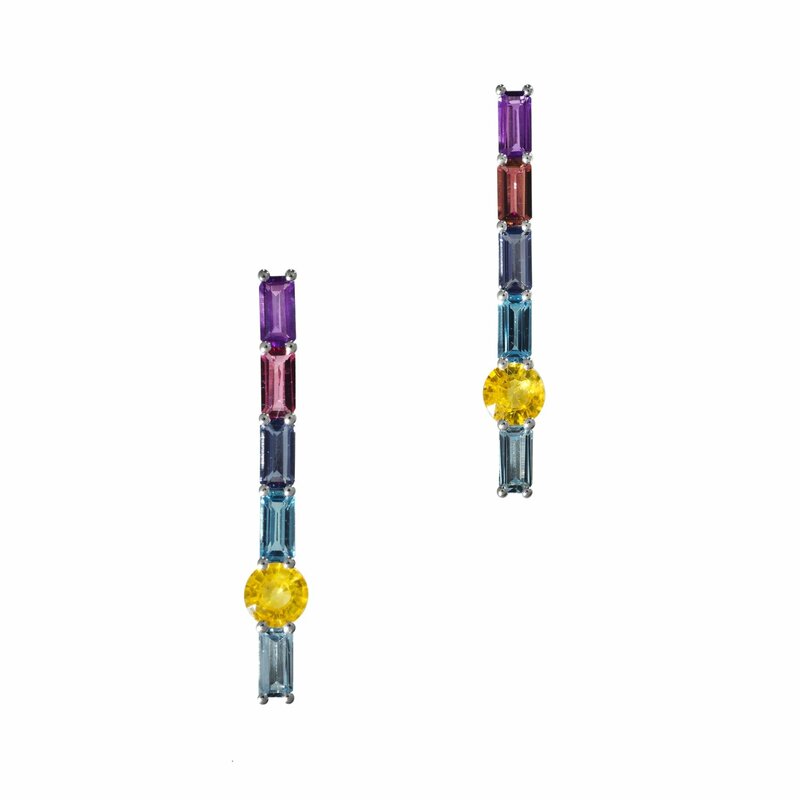 Spark Cluster earring measures 4cm by 2cm at the widest. Made to order in Yellow, Rose or White Gold with a four week delivery time. Opals and Yellow Gold small front facing hoop earrings and the Large Orbit Hoop Multiplier earring jackets sold as a set. Simple chic earrings set with round cabochon cut opals in 18 carat solid gold. 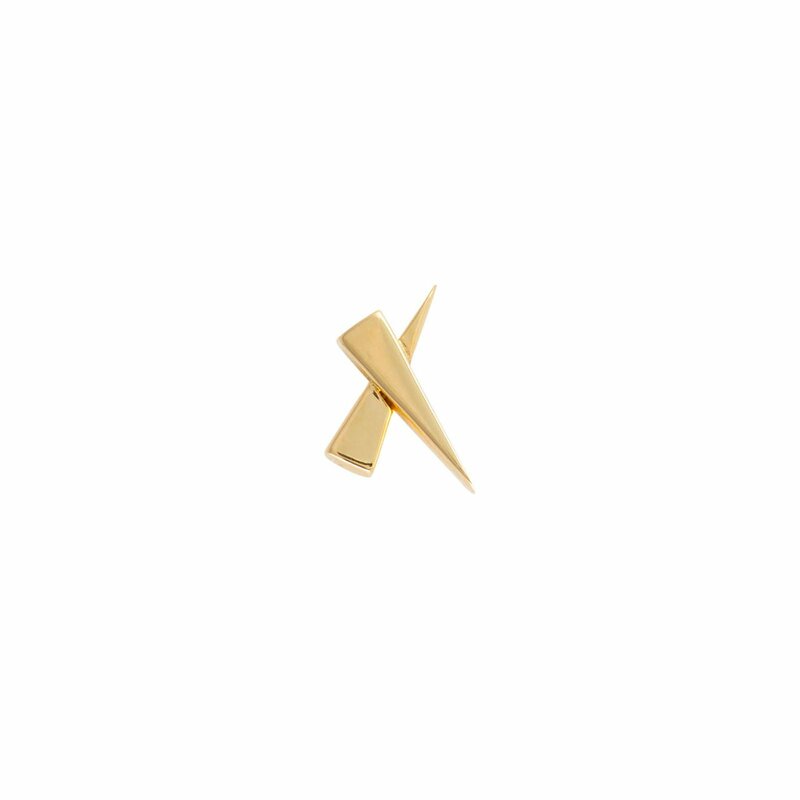 Perfectly geometrically balanced, elegant and flattering. 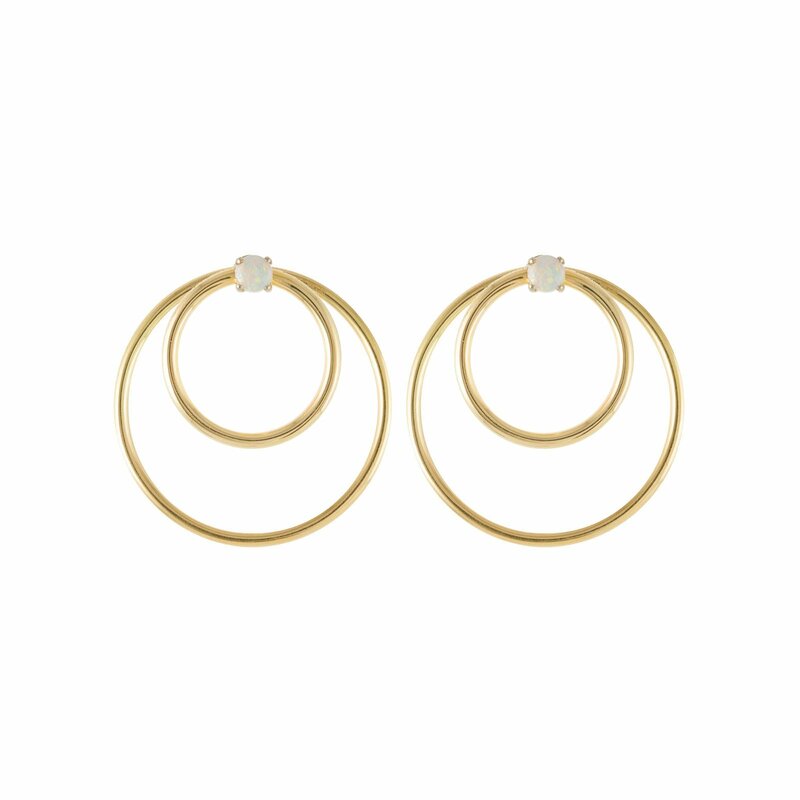 This set of the small Orbit hoop earrings and the large hoop earring jacket created a stunningly enhanced look when worn together to create a bolder elegant large double hoop earring as pictured. A fashion favourite as seen in VOGUE and elsewhere. 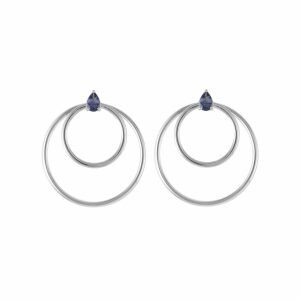 Our hoop earring multipliers are designed to create new variations of earrings from any pair of pierced earrings and work with your own earrings collection. 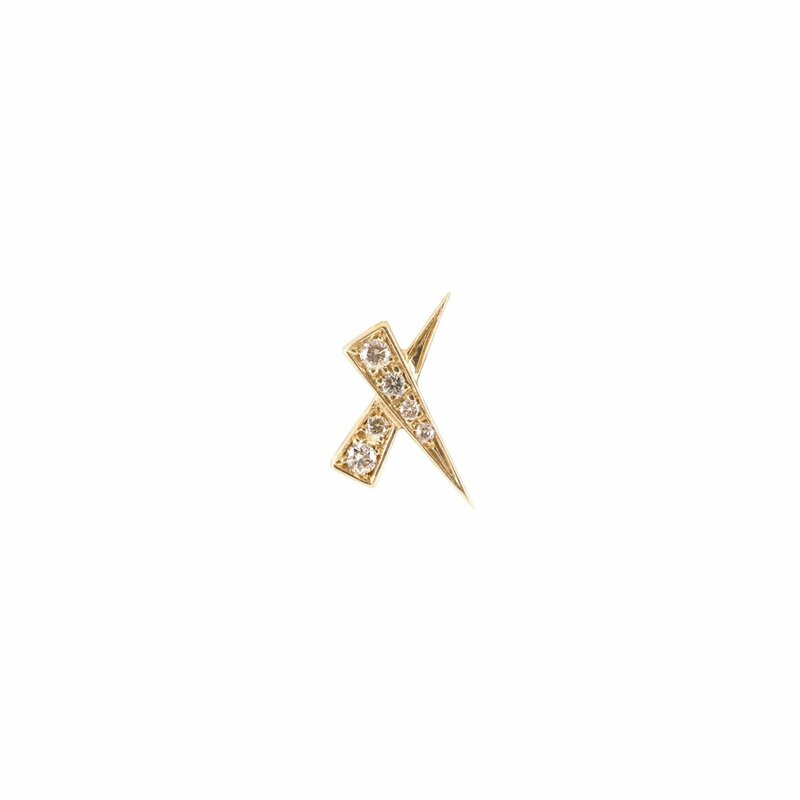 Quickly and cleverly doubling your earring wardrobe creating brand new larger earrings by slipping onto the bar fastening. Yellow Gold, 18k solid, 5.5g and 9g. Opals 2 round 4mm. Hoop diameter 2cm and 3.5cm. Bar pierced ear fastening. Large hoop slides on to the bar of any pierced earring in-front or behind the earlobe. 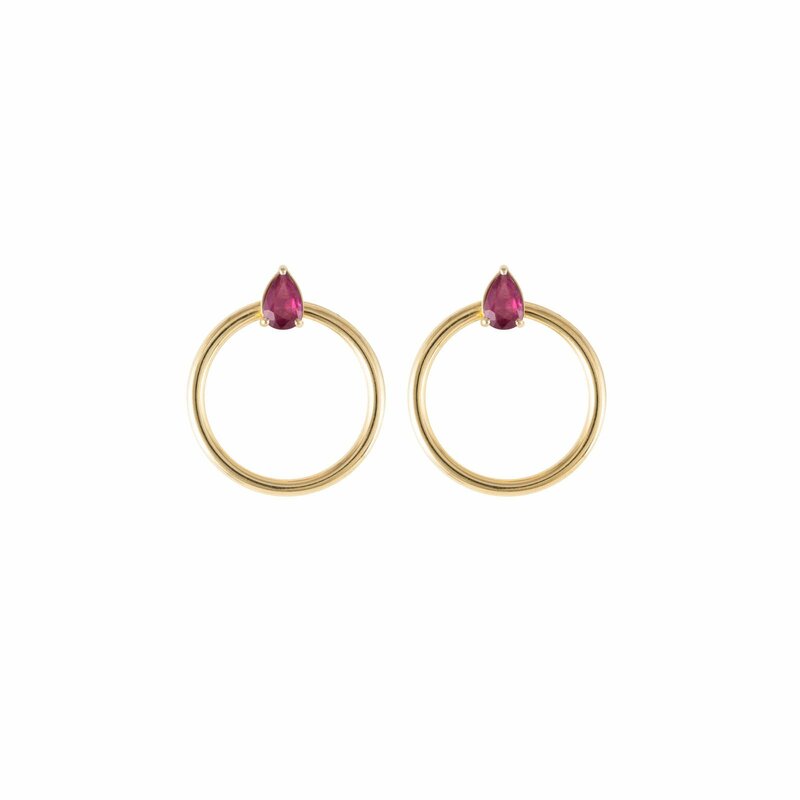 Simple chic yet interesting earrings set with teardrop shaped pear cut Pink Sapphire in rose gold. A perfect complement to the Quanta collection and stunningly enhanced when worn with the Large Orbit Earring Multiplier to create an elegant large double hoop earring. Rose Gold, 18k solid, 5.5g. Pink Sapphire 2 pear 6x4mm, 0.65ct. Hoop diameter 2cm. Bar pierced ear fastening.